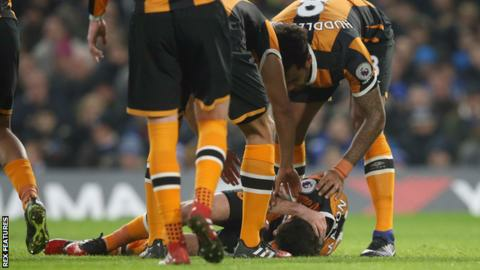 Mason, who won one cap for England in 2015, had to have surgery after a clash of heads with defender Gary Cahill. Mason started his career with Tottenham and joined Hull for a club record fee, believed to be about £13m, in August 2016. The Championship club said in a statement: "Ryan would like to put on record his thanks to all at the club who have aided his recovery to this point and he is indebted to them for their support and compassion over the past 12 months." Tottenham manager Maurico Pochettino, who Mason played under at Spurs, said "the door is open for me to help him". "He is 26 but his brain is amazing, he is an amazing person," he said. "He will be a very successful person in football, in everything he wants to do. For me, Ryan is a player who will always be special. "Don't worry Ryan, you are going to be a successful person outside the pitch." Mason posted this picture on social media on 31 December, saying "it's hard to put into words the year I have had"